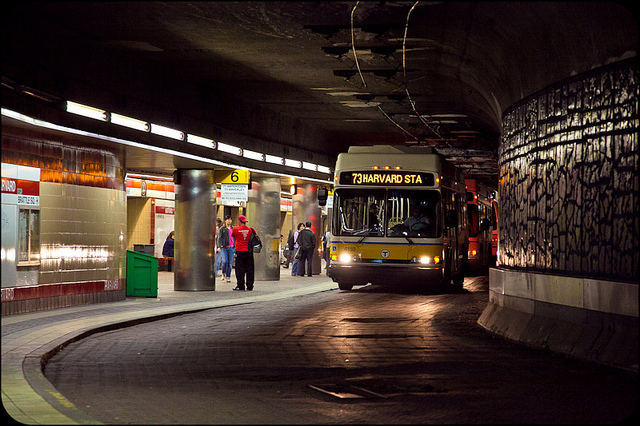 Harvard is essentially the transit hub of Cambridge. You've got the Red Line, 13 MBTA bus routes, Harvard University Shuttle buses, and Longwood Medical Area shuttles. 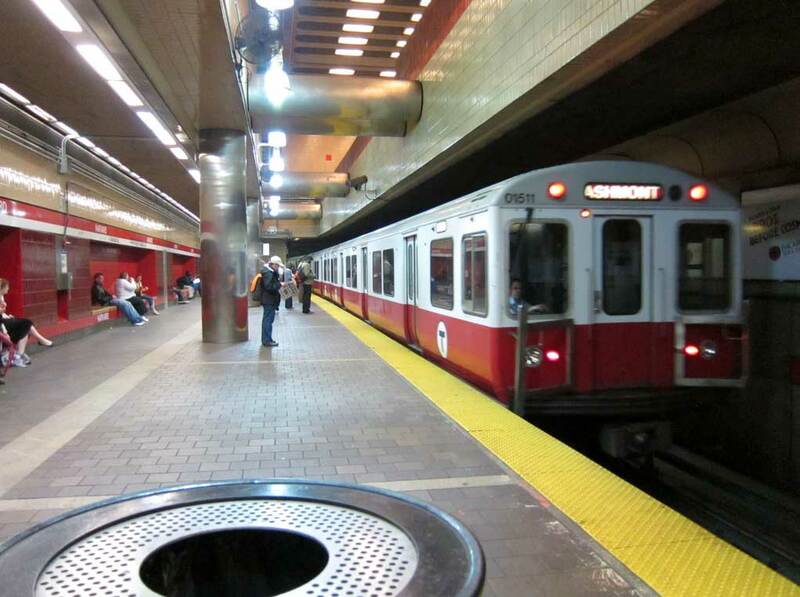 It's also the third busiest MBTA station (next to Downtown Crossing and South Station). Best of all, it has trackless trolleys, which are always a treat to ride. Now to the station itself: the main entrance is a bit of a hassle to get to, since it's an island in the middle of the street. There's a food stand inside, as well as bus schedules for every bus route in the system. There's a huge row of CharlieCard machines lining a wall, and even countdown clocks (still a relative rarity on the MBTA). Harvard is also one of the few MBTA stations with stacked platforms, with the outbound platform on top of the inbound. Another interesting thing about Harvard is the turn in the tracks just before the station. On the inbound side, trains make an extremely sharp turn, so don't be alarmed if your train is travelling extremely slowly and making screeching noises. The Harvard busway is simply sent from heaven. It's in a tunnel, so you're totally protected from the elements! Also, it has trackless trolleys, making the busway even more awesome. Awesomeness aside, though, Harvard is home to 5 (!) Key Bus Routes, making it a very important bus hub. However, two of these Key Bus Routes don't serve the busway. See, the routes that don't serve the busway use CNG buses. Turns out the CNG buses are too tall to fit into the tunnel without brushing the trackless trolley wires above! The MBTA had to reroute those buses. Overall, though, Harvard is an excellent station, especially with those trackless trolleys. Though it's a bit dingy in the busway, it's still better than waiting out in the cold. Ridership: Students. Lots and lots of students. Based on the crowds I've seen at this station, it's no wonder it's the third busiest. Pros: The busway is, as I said before, amazing, and the station is well laid out. Harvard Square is a great place in general, and there are trackless trolleys. You gotta love the trackless trolleys. Cons: The process of getting off a bus in the lower busway is annoying. You have to get out of the right side of the bus, then walk around to the left where the platform is. I'm always afraid I'll get run over when I'm walking in front of the bus, going to the platform. Nearby and Noteworthy: Too many to list. The Harvard Coop is an huge bookstore with a wide selection of books (among other things). There's also Harvard University, of course. And being theater fanatics, my parents often take me to shows at the A.R.T. Latest MBTA News: Orange Line shuttle buses - yay! There will be shuttle buses running from Sullivan Square to Oak Grove tomorrow until 3:00 PM. Normal service will resume after that. HARVARD FEELS LIKE ONE OF THE BUSIEST STOPS! Yeah, it's always insanely busy. I <3 the red line! It's my favorite train route!!! Though I dislike your blatant use of common computer "shortcuts," i.e. <3, the Red Line is my favorite line as well, at least for convenience. I always enjoy riding the Green Line more because of the things to see. Ok what was I supposed to say???? I heart the red line? It was faster anyway, I had to do my hw. I bet you've herd it though. The Kingston Trio - M.T.A. Thanks! I love that song, too. Does the station actually contain all of the bus schedules for all of the bus routes of the MBTA? I love collecting bus schedules and whenever I go through Harvard, I usually only have a chance to grab one and hope I don't already have it.